I found the bourgade on the 23 September and once I had found it I wanted to watch it more. 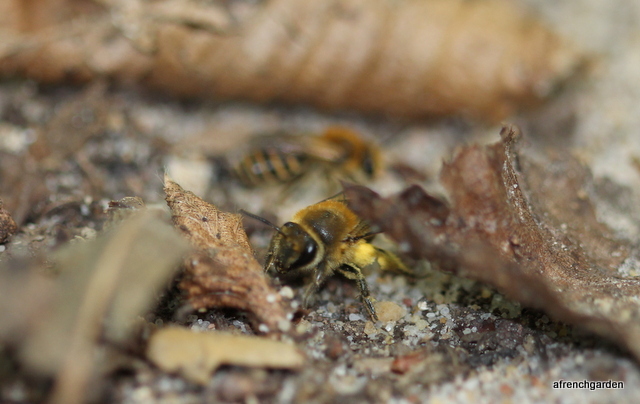 I loved to see the females coming back loaded with pollen to disappear down their holes. 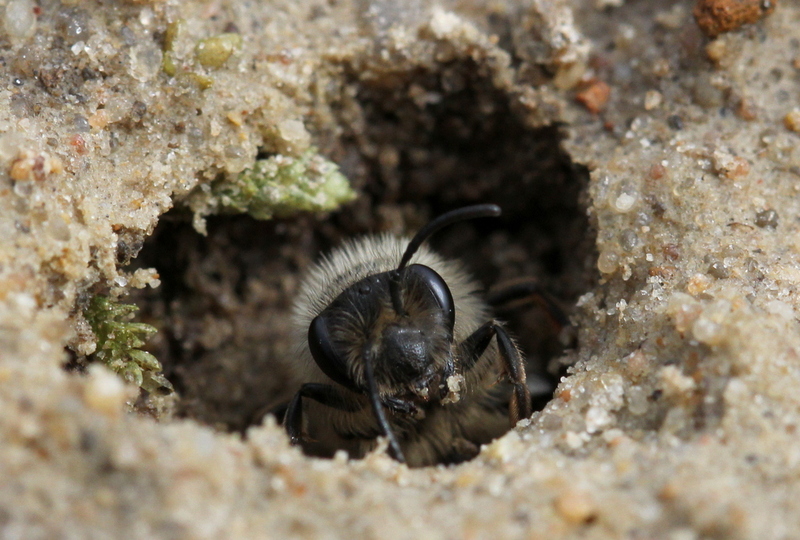 The males were still patrolling and checking out the holes for females but despite the warmth and the still sunny days, there was less activity from the males. 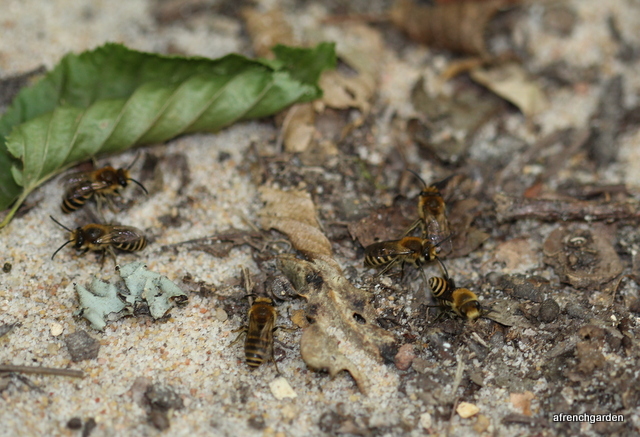 Not all the females made a “bee-line” for the correct hole. 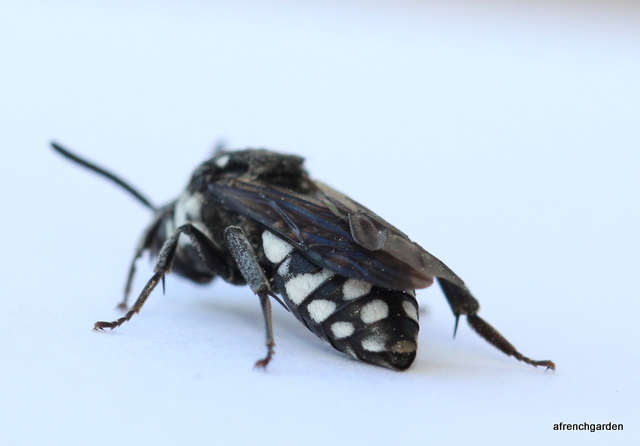 This female noticed her mistake and came out again. 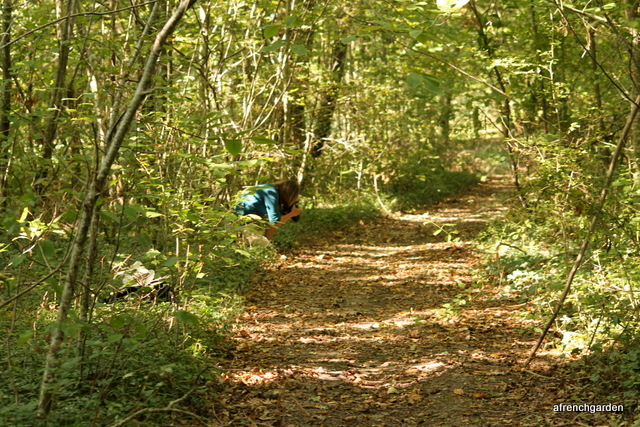 Then came the hunt for her correct hole. Had she misplaced it or had the leaves covered it? We did take care to not stand on the path and destroy any of the openings to the holes. 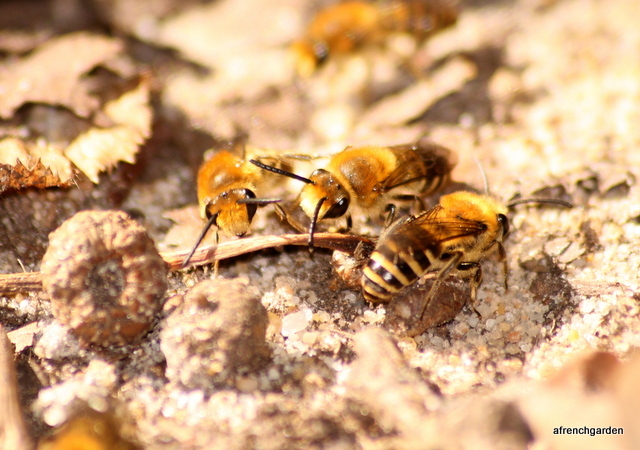 I did notice that all the females were not exactly the same size and there were a few smaller ones that were not as vigorous. 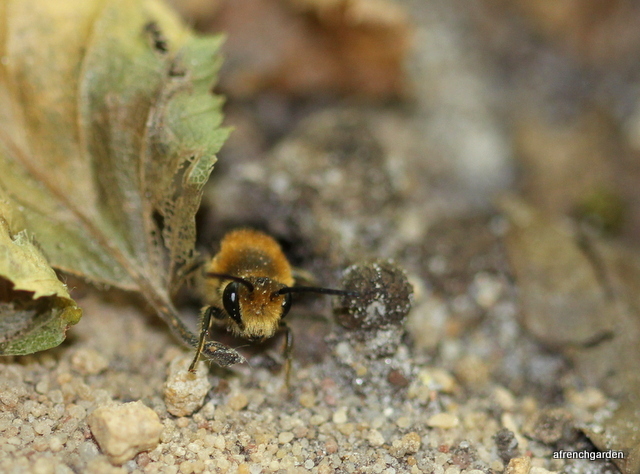 This little female let herself be picked up and did not seem to be in a hurry to dig a hole or collect pollen. 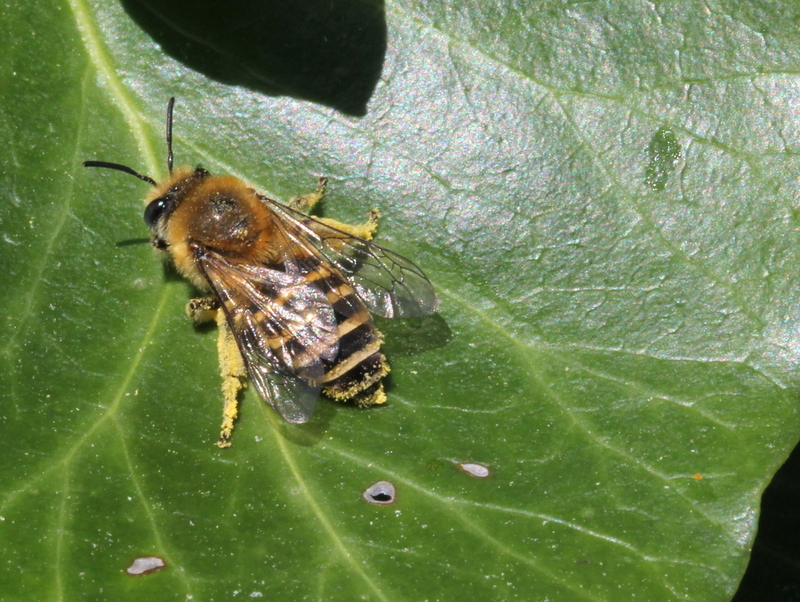 I only saw the one cuckoo bee surveying the bourgade on my visits. 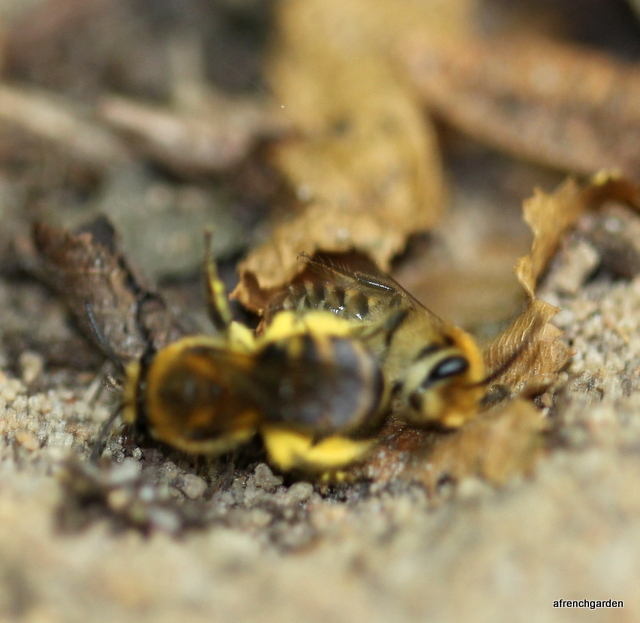 It was visiting the holes of the ivy bees but I found it very difficult to photograph as it folded its wings over its back when it was at rest on the ground. I had a good idea what it might be but I could not be sure. So she had to be caught and taken home for a closer look. And flying inside a capture jar. 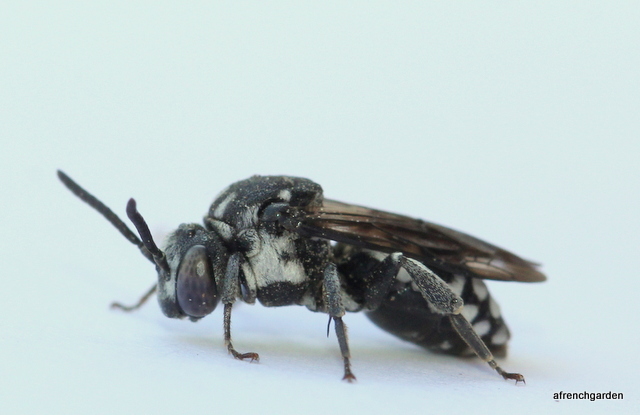 I am reasonably certain that it is Epeolus fallax. 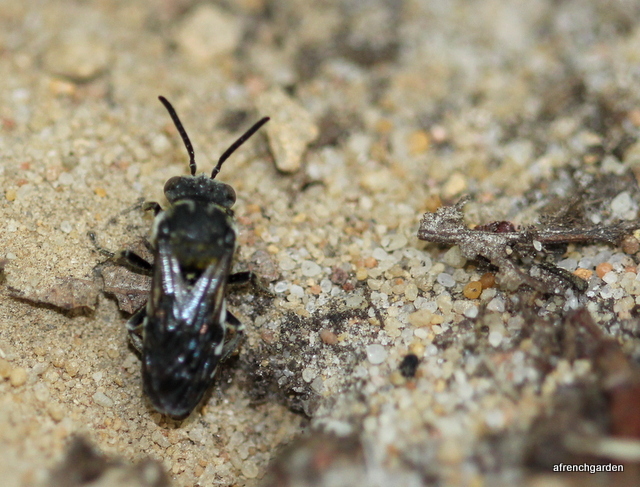 This is not the only bee that will lay its eggs in the Colletes hederae nests and I have seen mention of Epeolus cruciger as another cuckoo bee. One thing I noticed even a week after my first visit was that the mating was a continuous event. 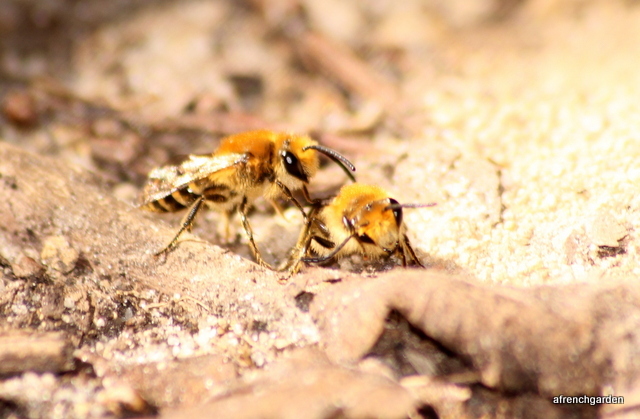 The females can be pounced on by several males. 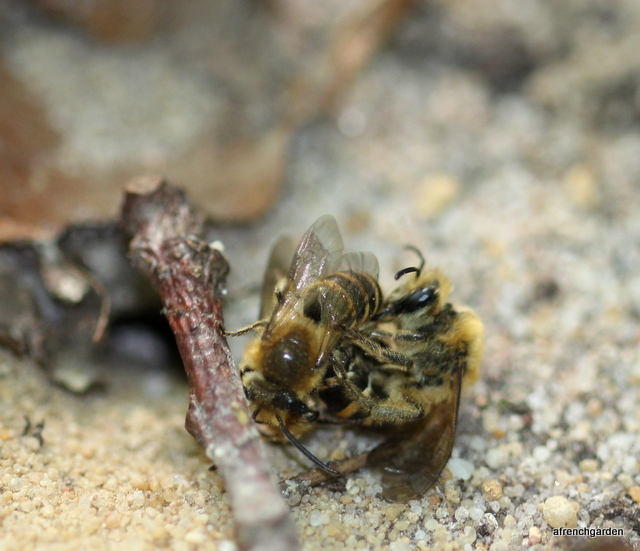 Here the female has struggled to the surface of the mating ball that will tumble randomly over the ground propelled by the force of the different participants. 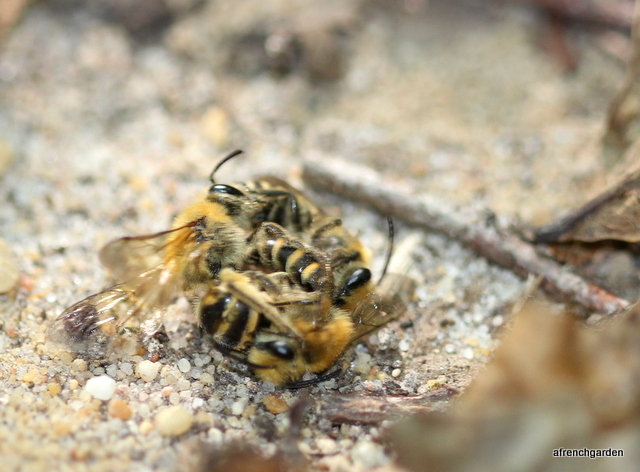 The female, on the right hand side, has now got the upper hand and pushes free to take flight for a pollen search. 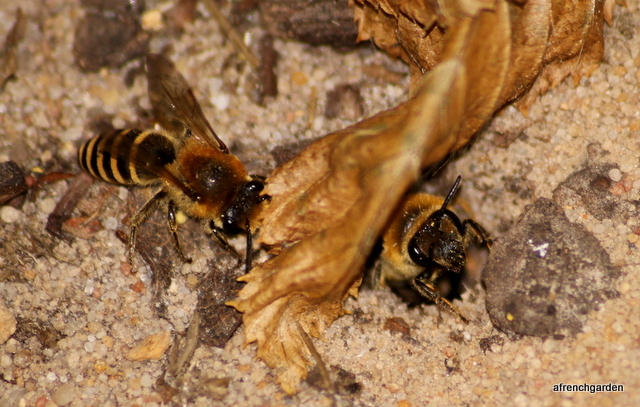 From accounts I had read I had imagined that this frenetic mating only took place as the new females emerged but it looks to me as if the males continue to search out the females whether they have previously mated or not. I am lucky to have discovered this nesting place so close to home so that I will be able to keep an eye on it next year too. 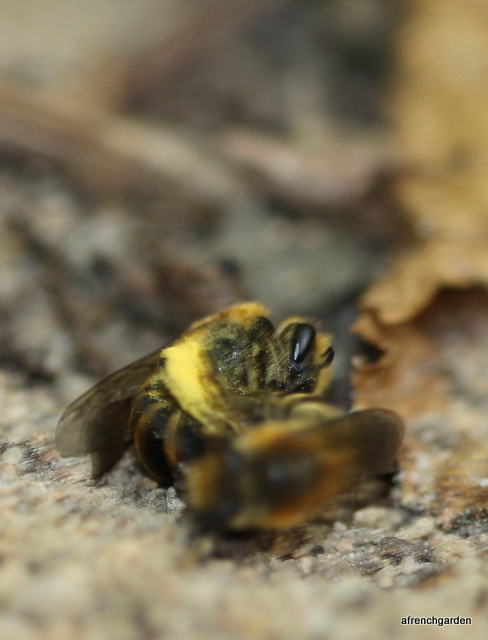 I am continuing my winter identification of the bees I have seen last year. 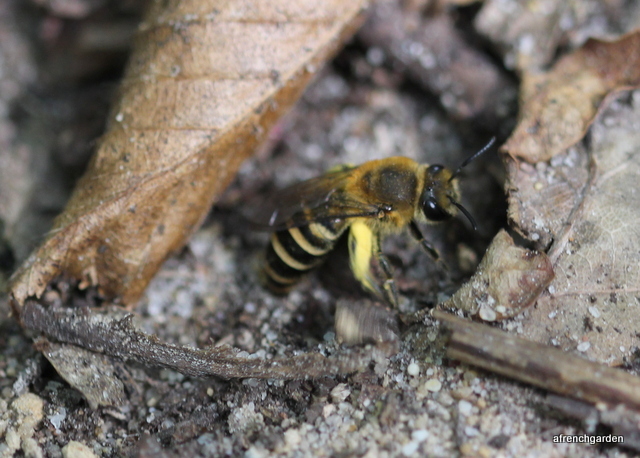 This will be the fifth bee I have identified. I first saw the nest near one of the apple trees and I marked it with a stick so that I could keep an eye on it. 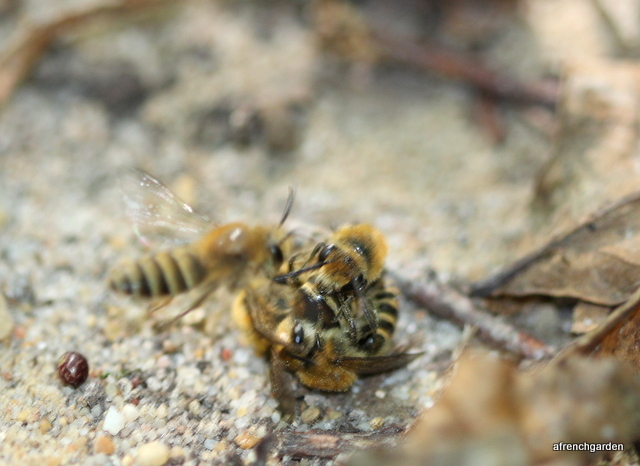 I was rewarded later when I caught site of a bee heavily laden with pollen. These photographs are taken without a Macro lens. When the photographs are enlarged I could notice a droplet at the far end of her abdomen but the quality of the photograph is poor. 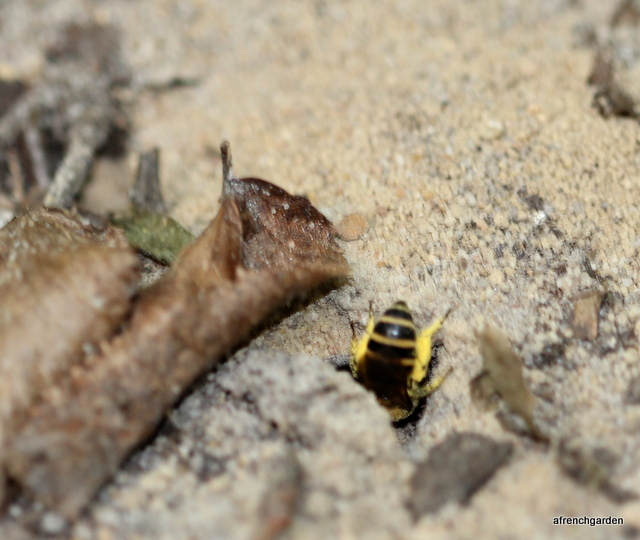 I tried to check it as often as I could but although it remained open, I had no more luck in seeing my bee. 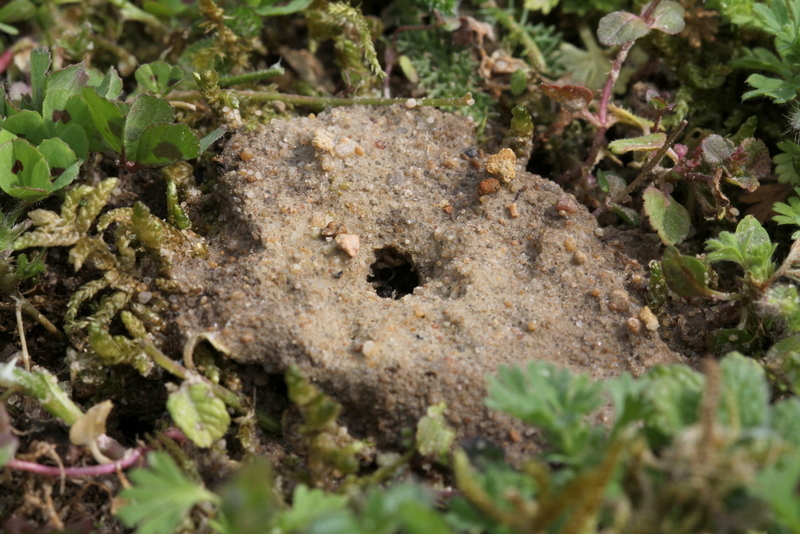 Then on 31 March when I looked into the hole it looked darker. As I watched an eye appeared. I became braver and tried to get a little closer as she seemed so absorbed in her work. 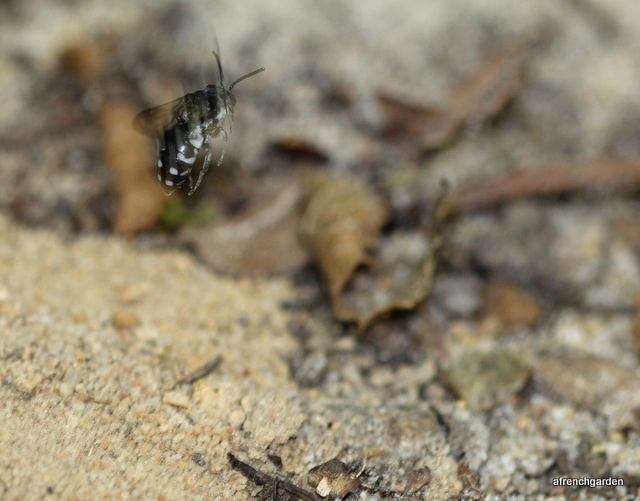 I had now bought my Macro lens and was able to get a better shot. 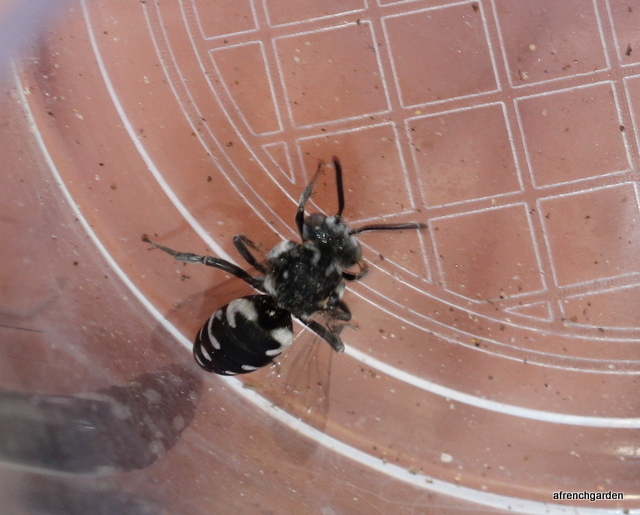 Colletes is the only genera with S-shaped second recurrent vein on the forewing so later I was able to identify the genus. I watched her for 37 minutes, taking quite a few photographs. It wasn’t until near the end that I realised she was, in fact, closing her hole. Satisfied her work was complete, she flew away. 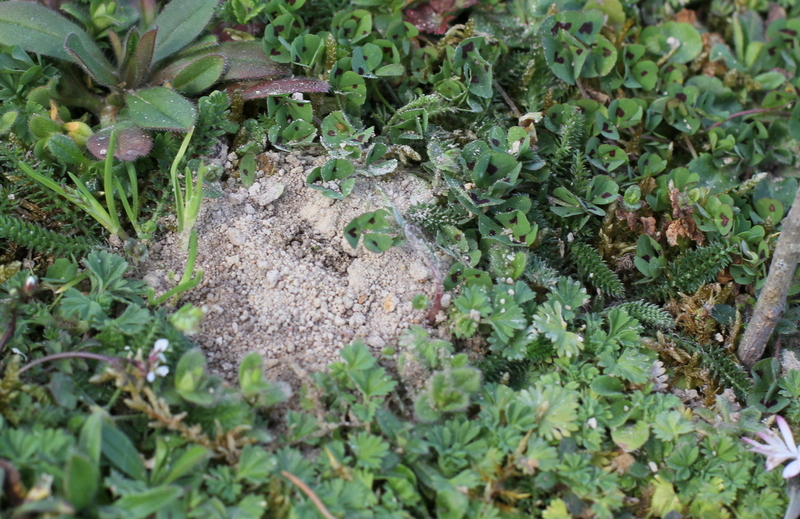 I kept watch on the hole but it was never disturbed and gradually disappeared under the vegetation that constitutes our lawn. We have willows or I believe sallows (Salix caprea) that were flowering from the beginning of March last year and also a very large plum tree that started to flower mid March so I think she would have not have had to fly far for pollen. 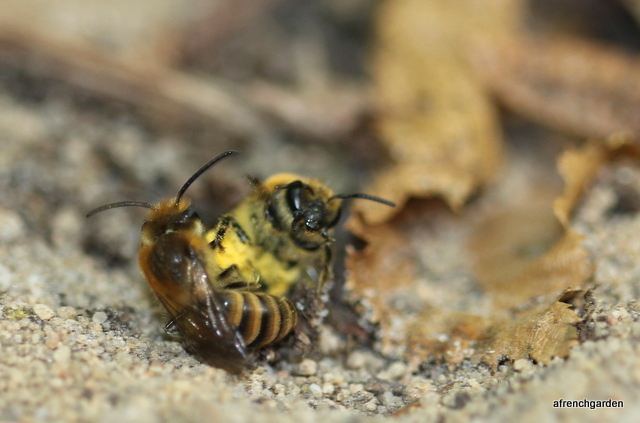 The droplet on her rear abdomen intrigues me as the Colletes produce a cellophane-like material to line their nests and I wonder if this could ooze onto her abdomen. Another intrigue! 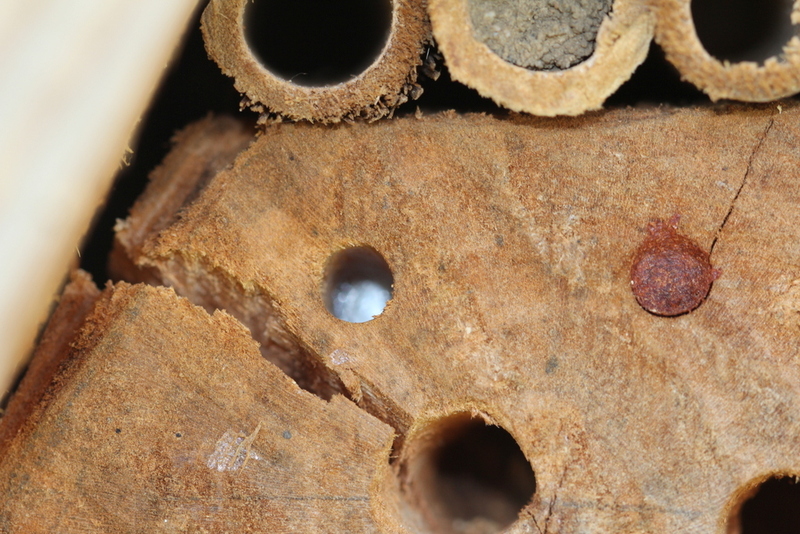 I found this layer of cellophane-like material adhering to the outside of a bee hotel in my front garden in August. 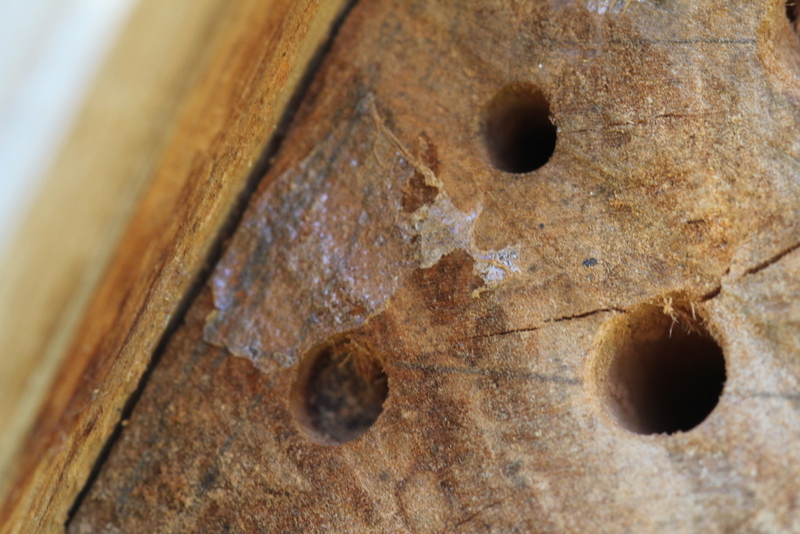 Close by a single hole had been sealed by what looked like the same material. The photograph is poor as the surface was reflective and I was not able to show the shininess of the surface in my photographs. 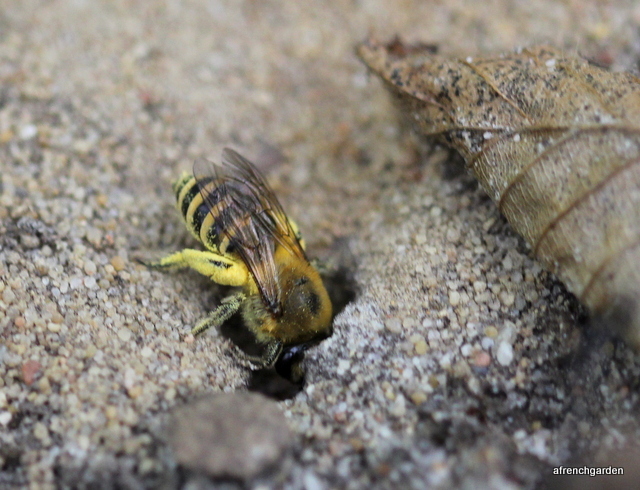 Do any Colletes species nest in holes in wood? 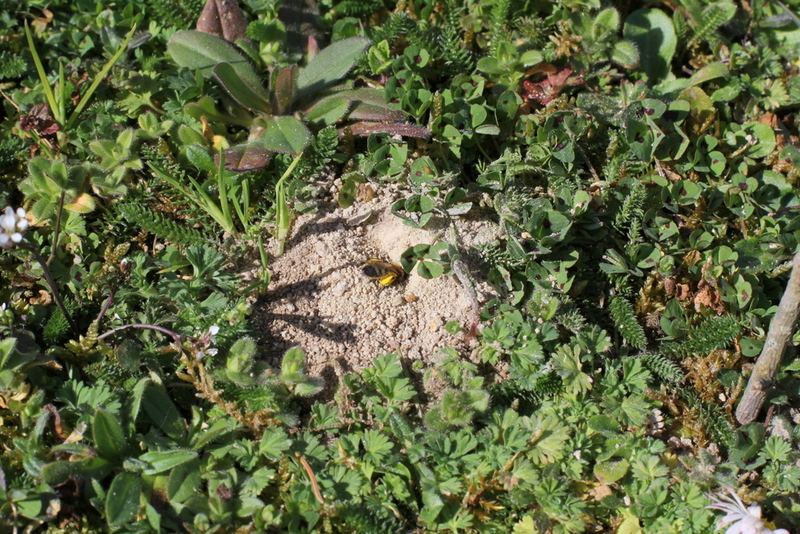 Does another bee use this material to fill its holes? I’d love to find out. 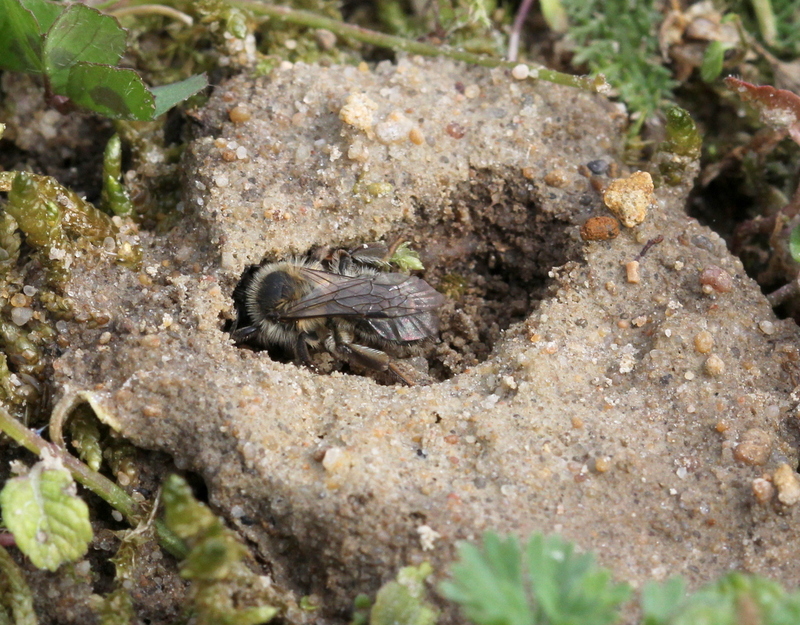 I’ll be keeping my eye on my bee hotel and also on the area that my Colletes has built her nest. 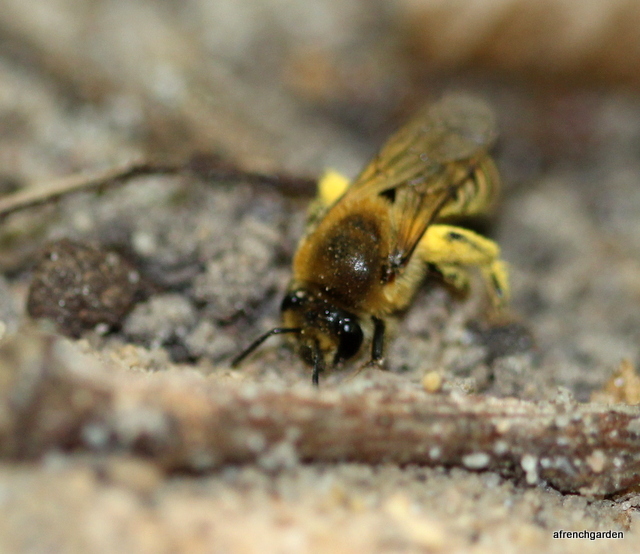 My sandy soil and willows might attract even more Colletes to nest in the garden. 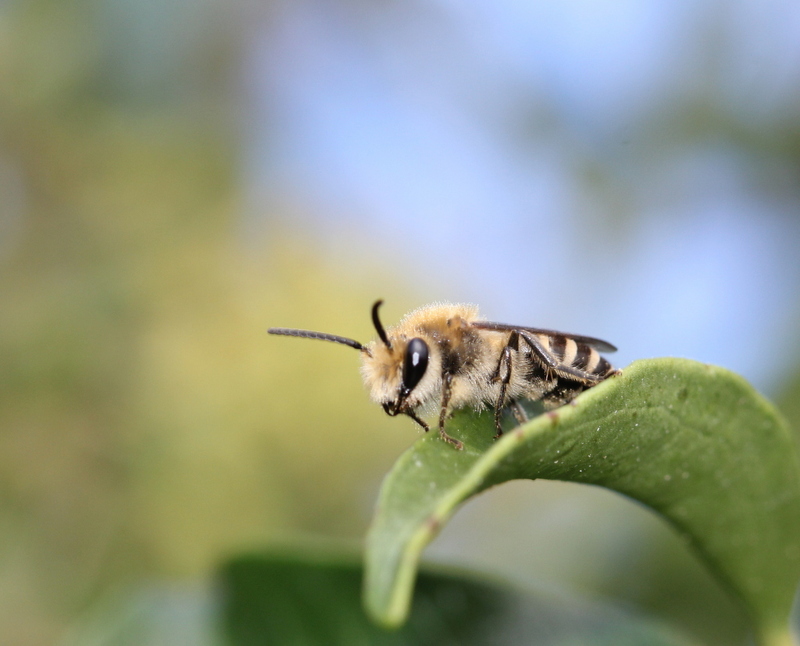 My second post is on the last bee of the season that I have seen. I was so thrilled to find him that I used the photo above as the seasonal header for my garden blog a French Garden. 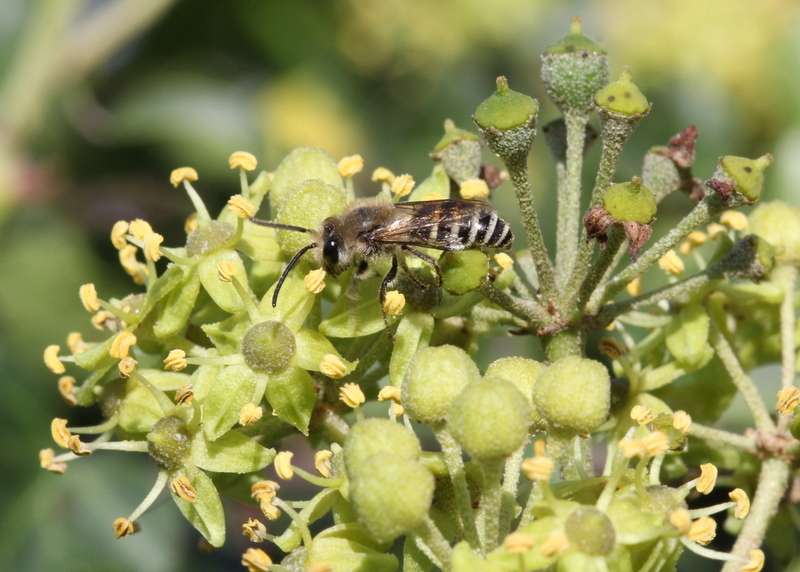 Colletes hederae is also called the Ivy Bee as until recently it was thought to be monolectic on ivy, that is it collected pollen only from ivy. Recents studies examining the pollen loads of C. hederae have shown that it will collect pollen from a variety of different sources. 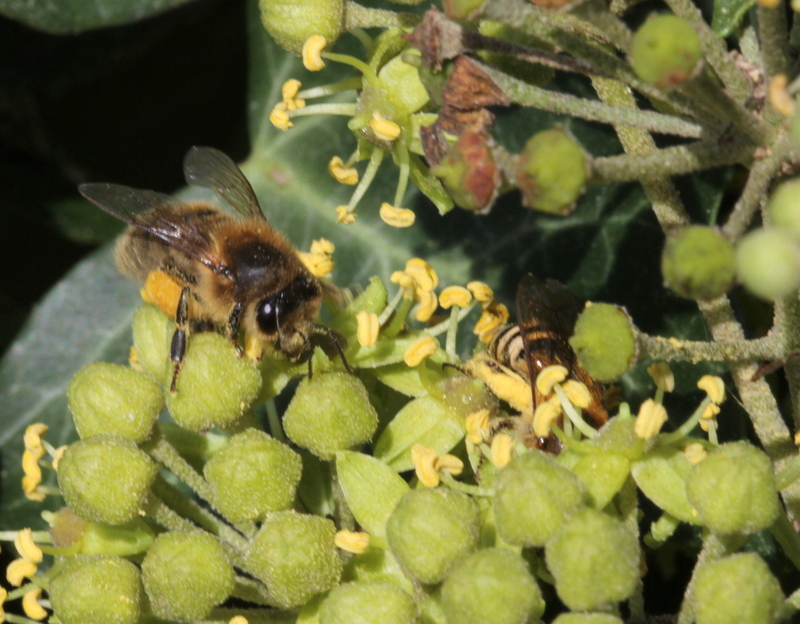 The males of C. succinctus and C. halophilus are very similar to the male C. hederae so I do not think that either of them will be on the ivy near me. 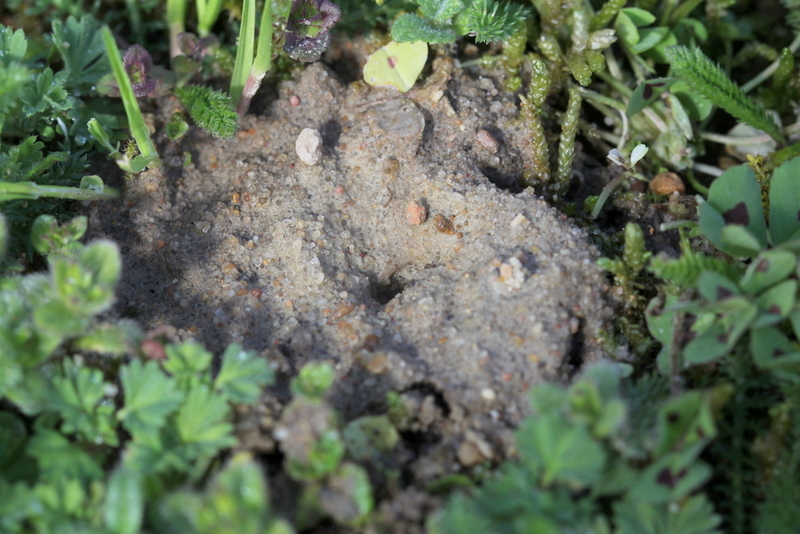 C. halophilus prefers coastal areas and both are more attracted to heathland. I have never found any heather growing nearby so it is not their preferred habitat. 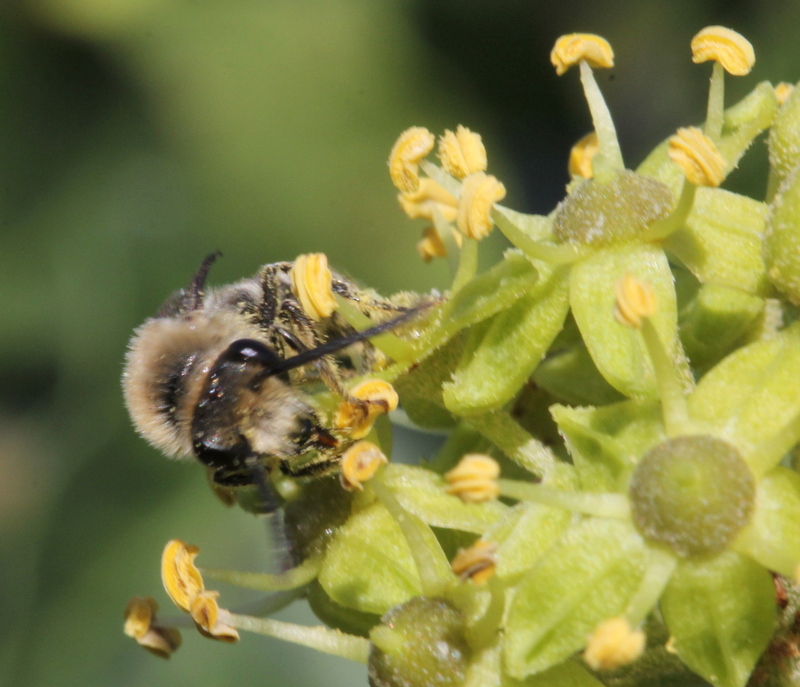 The female is an eye catching bee and can be easily distinguished from the honey bees that are always present on the flowering ivy. 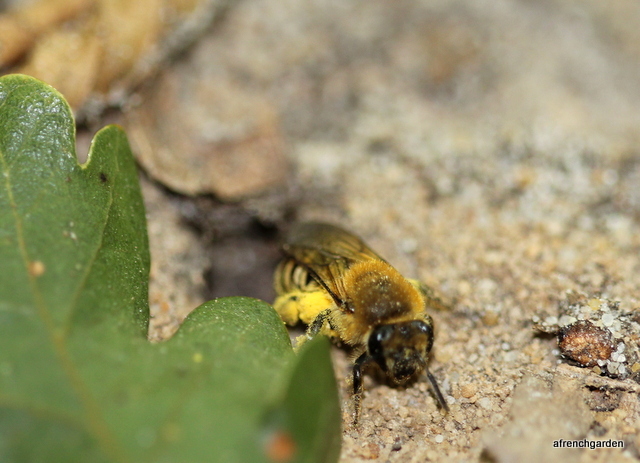 She carries the pollen loosely all over her hind legs. In France they can be found between the end of August and the end of October. 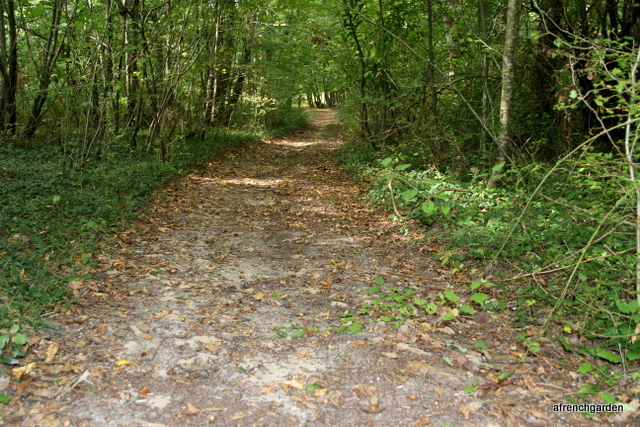 I took these photographs on a sunny day at the beginning of October. I have a love hate relationship with ivy. In my garden it will choke all vegetation that stands in its way and for that reason I continually pull it out. Outside in the woods it grows high into the trees providing a wonderful source of nourishment for all kinds of creatures when it flowers at the end of the summer. Never the less it appears to me very invasive in the woods too, lying thick on the ground in many places choking out all competitors. 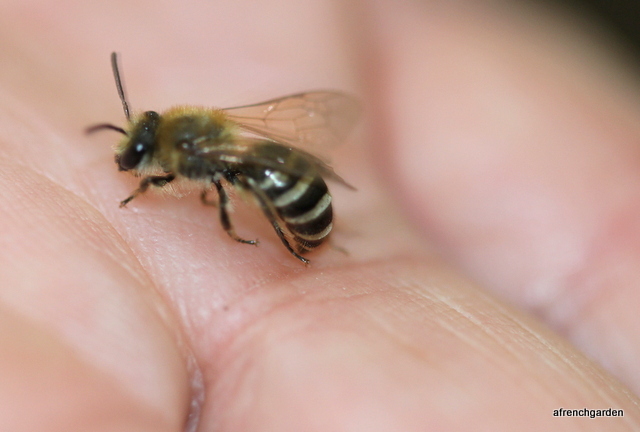 When the honey bees gather the ivy pollen their sacs have a much more waxy appearance. Standing beside the ivy in full flower on a sunny day is a heady experience. The perfume from the flowers is intense. Different people describe the perfume as pleasant, of no particular interest or distinctly unpleasant according to their particular sensitivities. 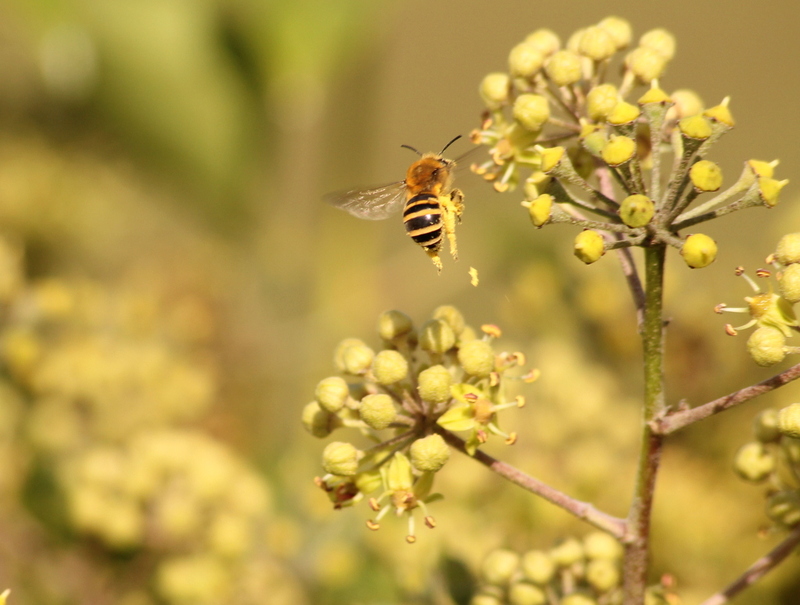 Both the honey bees and the Ivy bees attempt to retrieve the maximum amount of pollen. 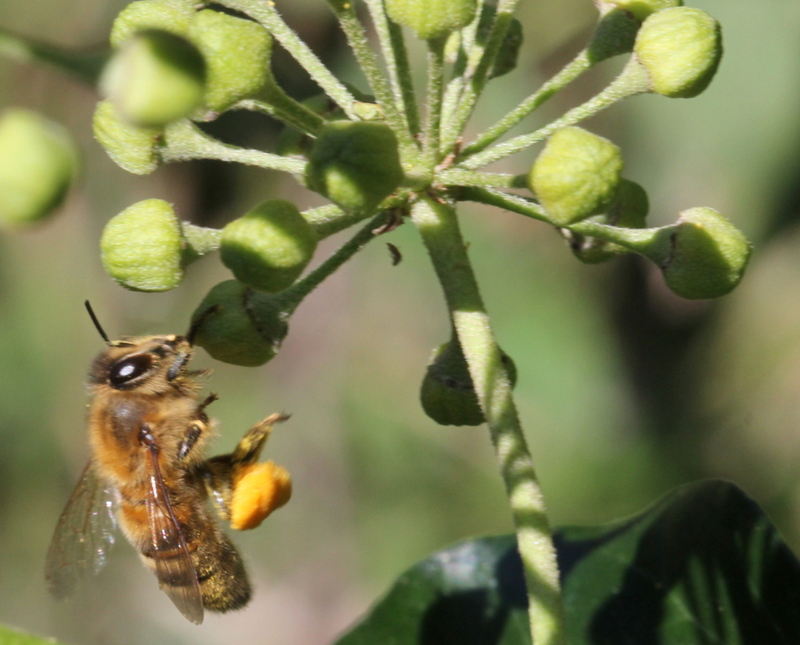 The honey bees too carry huge loads of the ivy pollen. 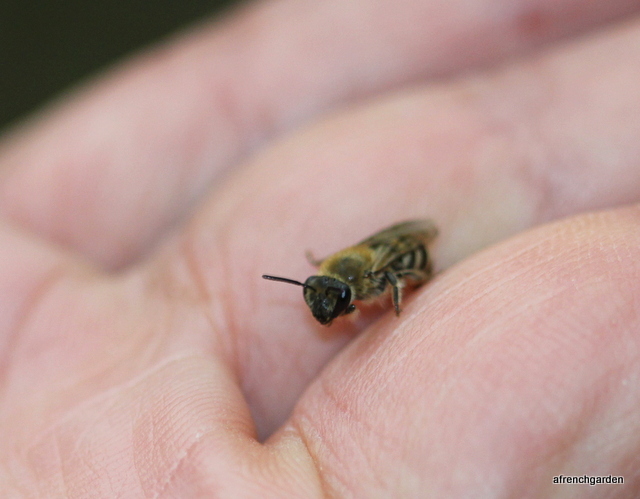 It is difficult to imagine them flying back to their hives with such large loads. 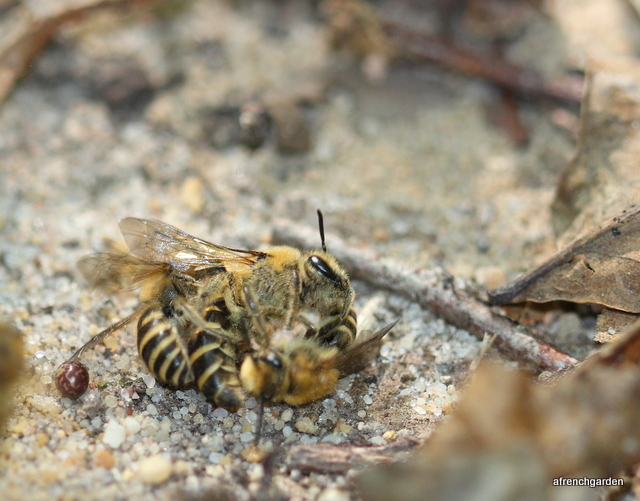 Perhaps not all the pollen can be carried back without some being dropped but there is plenty for all. 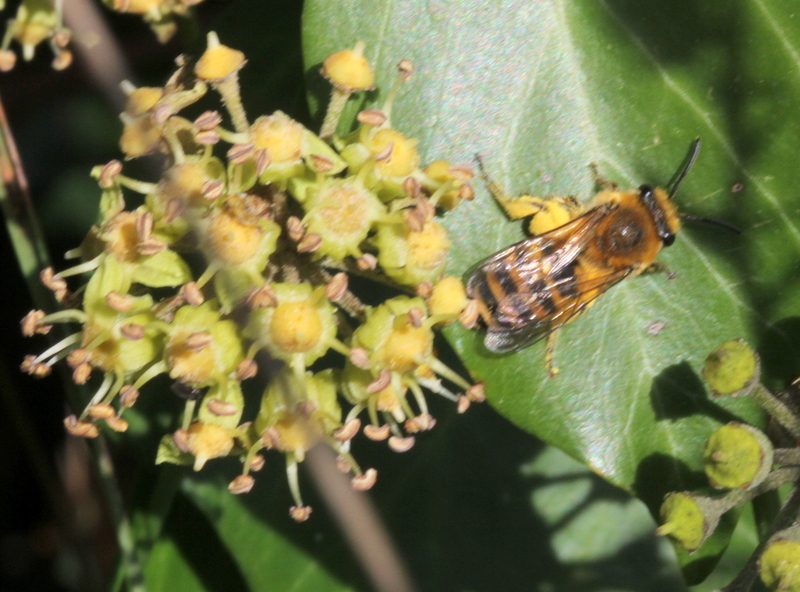 My regret this year was that I was late in my search for the Ivy bee and I was not sure if the bee was present nearby. 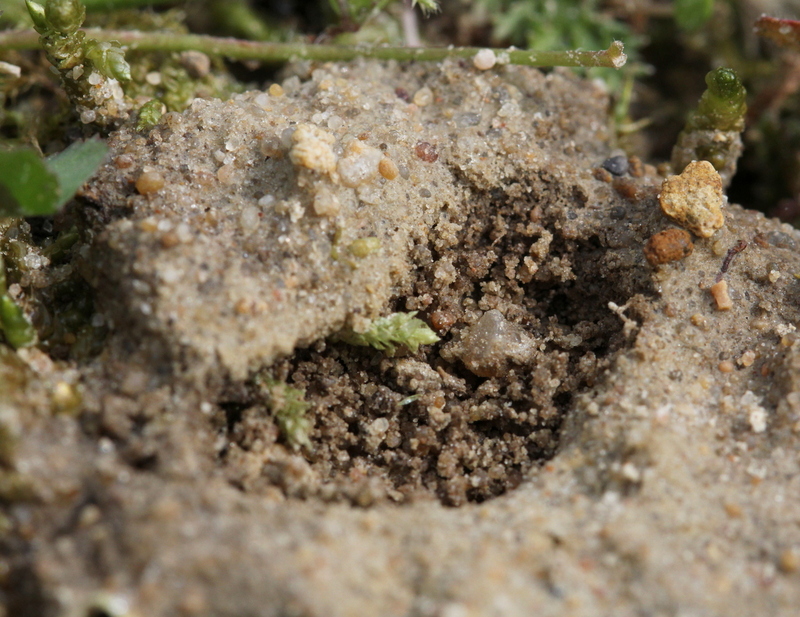 C. hederae nests in huge aggregates in the soil and the dry sandy soil of this area would provide an ideal base for nest building – the only problem is where. 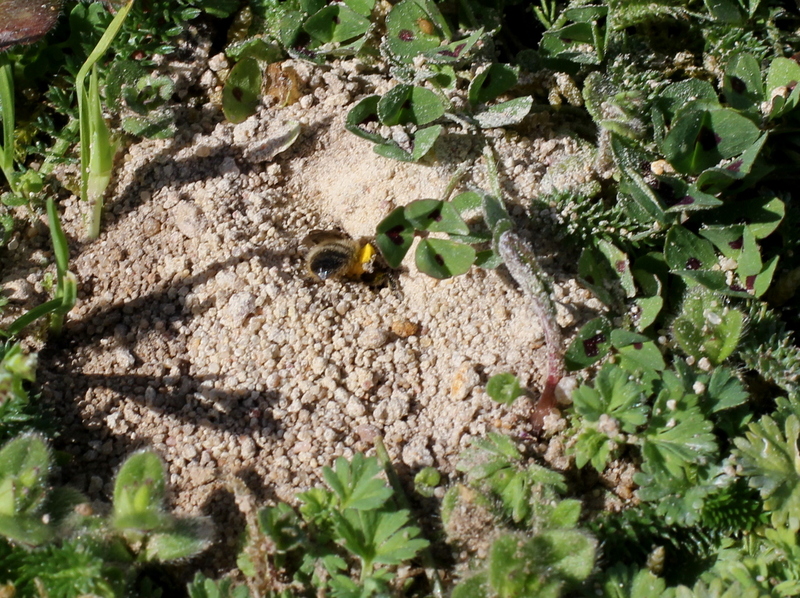 Now my challenge for next year will be to look out for suitable nesting sites for these late flying bees.